1. Take time to remember loved ones who have passed on. Día de los Muertos is the time to remember loved ones who have passed away. It is a blessing and a gift that connects us to our past and has been commemorated for centuries. Many people also celebrate Halloween at this time, but there is a big difference. Halloween speaks of ghost and goblins, vampires and zombies, witches and devils to scare away bad spirits away. Dia de los Muertos invites our loved ones back to guide and protect us. It celebrates connections that live on! It’s not scary – it’s sacred! This is especially meaningful for me. Being the youngest daughter in a large Latino family. I got all kinds of help, protection and love from my older sisters. They were my champions, my greatest supporters. My sister Maggie was the heart of the family showing love to everyone. During Dia de los Muertos, I welcome her home and remember all she gave me. This week take time to remember your loved ones – celebrate their lives – and give thanks for their contributions to your life! 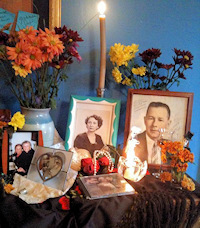 Juana Bordas’ Día de Los Muertos altar with pictures of her mother and father. The centerpiece of Dia de los Muertos is the altar. These can be very elaborate, but also be very simple – the important thing is to welcome and to reconnect with people by remembering them and the things they loved. Want to do an altar this year? Find pictures of your grandparents, friends and relatives you want to remember. Place some marigold flowers in a vase and light a few candles. Gather some of their favorite items or things they use to enjoy. For my father I place a small glass of brandy; for my mother chocolates and music by Julio Iglesias, her favorite Spanish crooner. To welcome your familia cook their favorite dishes – after all you are inviting them to visit – so be hospitable. Post pictures of your family and your altar to share with others. Spend a few minutes each evening lighting a candle, remembering, and inviting your loved ones to guide and support you. The night of October 31st the cemeteries in Mexico are aglow with candles, marigolds, and Kahlo lilies. The whole community commemorates together. Families gather with food, music, and drink. There is much talking, story-telling, and remembering. Mezcal made from maguey, a sacred plant in Mexico, is passed around to keep the spirit warm for the night-long vigil. You can invite people to share a favorite meal or drink of their departed relatives. Tell stories about them. What made them special? 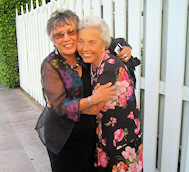 Toast their lives and contributions.”Los Muertos” deepens the circle of life, strengthens the connection between generations.Have people reflect on and share the wisdom, gifts and lessons of their relatives’ lives. My sister Rosemary was stylish, self-educated, a businesswoman, a powerhouse, and a matriarch. She always thought of family first. She taught me that I can achieve my dreams and do it in a way that uplifts others. 4. Reflect and Plan: How do you want to be remembered? makes for a happy afterlife! In Oaxaca, Mexico the evening of November 1 is alive with costumes, bands, food and drink. People parade singing and dancing from house to house. Cadavers are dressed to the nines, sometimes humorous and whimsical. This speaks to a different relationship with death -and the afterlife. Not a scary or dark event – people laugh at the “grim reaper.” Death cannot separate us from those we love and we rejoice that we have lived yet another year. “Los Muertos” reminds us that la vida (life) is fleeting – the time to act, to do accomplish, and to celebrate is now – ahora! During this solemn and yet festive time – Take time to reflect on your own life journey and the legacy you wish to leave. How do you want to be remembered? What have you been putting off doing? What is one thing you can do to advance your legacy?